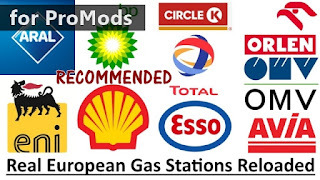 You've always used the Real European Gas Stations Reloaded mod of ExiaRS and Stripy. There's been a nice improvement. I noticed a little late but I wanted to share it with you. A ProMods-specific version of this great mod is released. This mod replaces all original gas stations in ProMods. This work is based on the original Real European Gas Stations Reloaded. Compatible with Promods and Promods TCP.